John Lineker might have a new dance partner. Lineker was scheduled to take on former Ultimate Fighting Championship (UFC) bantamweight title holder Dominick Cruz at the now-postponed UFC 233 event. “The Dominator” ended up suffering an injury and was forced to pull out of the bout. While it looked to be a huge opportunity for “Hands of Stone,” the tables may be turning. 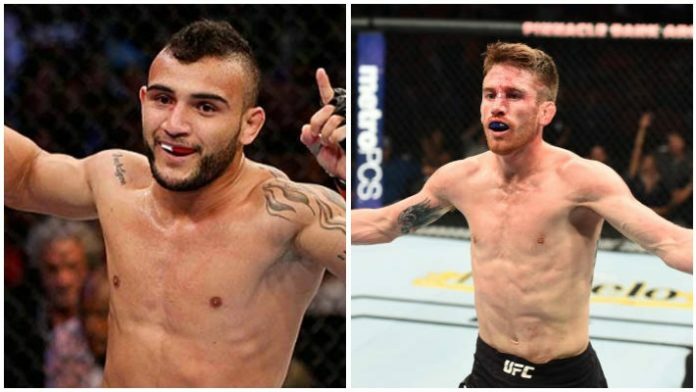 John Lineker vs. Cory Sandhagen is in the works for UFC Brooklyn on Jan. 19, multiple sources told ESPN. Sandhagen was originally scheduled to face Almeida but it appears NYAC hasn’t cleared him to fight on January 19th. The UFC wanted Sandhagen to remain on the card so they offered Lineker who just lost Cruz as an opponent for March. The fight has been verbally agreed for. Lineker once had a big opportunity to face a man who many consider to be the greatest bantamweight of all time. Now, he’s giving a big opportunity to Sandhagen if the bout ends up coming to fruition. Sandhagen isn’t ranked, but that’ll certainly change if he can top Lineker. UFC Brooklyn will be headlined by a champion vs. champion bout. Flyweight title holder Henry Cejudo will put his gold on the line against bantamweight title holder T.J. Dillashaw. MMA News will bring you live coverage of the event as well as provide more updates leading up to fight night. Do you think fighting Cory Sandhagen is a big risk for John Lineker?